With the league phase nearing its end, both the Sydney franchises are firmly in the race for a semi-final birth although it is the Sixers who are more than just in the race. Banking on their pace attacking, the Sixers have been clinical over the past few matches and have seemingly booked a semi-final spot as well. On the other hand, Sydney Thunder have been resilient throughout the campaign with stellar performances against Perth Scorchers and the Sixers themselves in the reverse fixture, typifying their determination for a spot in the last four. 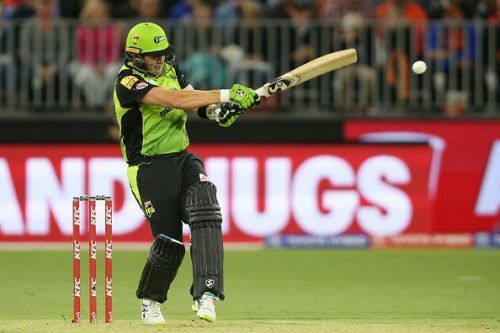 With the SCG set to host this derby, one can expect an action-packed match between two former champions of the Big Bash League. Josh Phillipe has been a welcome surprise for the Sixers who have struggled to fill the openers slot this season with Jack Edwards and Justin Avendano being tried and tested. With a fifty in the previous match against the Strikers, Daniel Hughes appears to be in good touch and could be one to watch out for against the Thunder. The same could be said for the captain, Moises Henriques as well with the NSW allrounder regularly chipping in with vital cameos. Ben Dwarshius was at his best with a brilliant spell of bowling to keep the Strikers down to a below par score and his performance adds to the glamour of an already bright Sixers bowling unit consisting of three out of the top six wicket-takers in the tournament. Sixers could play Pope instead of Manenti or Edwards. With the presence of three very good right handers in the opposition top order, they enter into this match as the firm favourites. Josh Phillipe (WK), Daniel Hughes, Moises Henriques (C), James Vince, Jordan Silk, Tom Curran, Sean Abbott, Ben Dwarshius, Steve O'Keefe, Ben Manenti and Lloyd Pope. The Thunder batting has been an issue of late with only one or two firing in unison while the others have gone missing. Callum Ferguson and Shane Watson have bailed them out on many occasions but would ideally want Anton Devcich and Jason Sangha to play more freely and express themselves. Callum Ferguson and Shane Watson have scored 369 and 301 runs respectively and much is expected of them on Saturday as well. After restricting the Renegades for the better part of their innings, the likes of Jordan and Sandhu succumbed to Cameron Boyce, who took the Renegades to a decent target and ultimately cost them the win. Daniel Sams and Fawad Ahmed need to find their form as soon as possible with both of them tailing off in the past few matches. Their performances could be crucial to the team's plight for a top-four finish. With variety in their bowling attack, it could be their day against a formidable Sixers batting unit. Shane Watson (C), Anton Devcich, Callum Ferguson, Jason Sangha, Daniel Sams, Chris Green, Baxter Holt(WK), Chris Jordan, Gurinder Sandhu, Fawad Ahmed and Jono Cook.